Need an office renovation but not quite sure where to start? Any type of renovation is overwhelming, which is why you need a focused, step-by-step plan. Here’s what we recommend to help you stay centered, on track, and get things done in the right order, so you end up with a pleasing office design. Many offices undergo a renovation for the pure and simple reason that they’re old, bland, and generally stale to look at. So, that might mean the office isn't entirely falling apart, but more likely it needs a fresh outlook, and redesign is necessary for the health and well-being of employees. Often, it means both. Regardless of the reason behind your renovation, it's important to get very specific about your key priorities that drive the project and understand the needs that are not just design related. Employees spend eight and sometimes more hours a day in this space, and it's essential that they are healthy, comfortable, and supported in their overall health and work-life needs. It's also essential that everyone on the project understands what existing conditions need to be updated. All should have a detailed report about the building conditions, including the state of mechanical and electrical systems, utilities, floors, as well as whether or not there have been major functionality issues in the past (even if they've since been fixed). 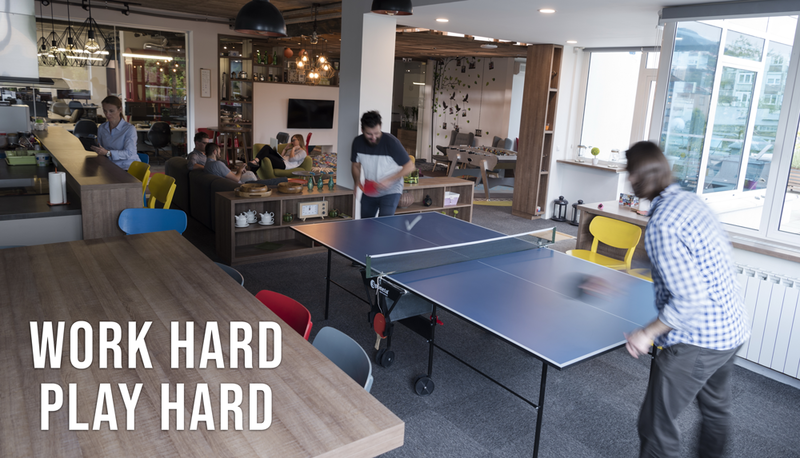 While some managers may scoff at the idea of having a ping pong table, creative games, or a lounge area because they believe it would halt productivity, the truth is that employees need the opportunity to take a break each day, which doesn't focus solely on their lunches, but that gets them away from the screen. Activities that encourage sociality, movement, and light play can lower stress as well as facilitate positive social interactions between staff who may not otherwise have a reason to chat. Having a room that's not just dedicated to meetings but that can be converted into a lounge or fun area can go a long way when it comes to helping people feel relaxed but still stimulated during their break time. Incorporating an exercise machine or even a standing desk area allows employees to vary their position from sitting to standing in order to get their blood flowing, avoiding the serious health risks of a sedentary office lifestyle. No matter who you are or what construction company you use, you absolutely must be prepared for surprises, which could concern the timeline, budget, or any other areas. There will likely be snags along the way, as there is with almost any renovation, and these types of problems could set you back thousands. Be sure to set aside a contingency budget for emergencies so you can handle the budget better. When it comes to office renovation, it's imperative that you take a proactive approach in order to understand your key purpose, add value to your employees' work-life balance, and prepare for unexpected delays. Managers planning renovations need to have a thorough understanding of what is needed for practicality not just in a design sense and understand how this could impact the overall renovations schedule. For example, adding new technology or updating infrastructure can delay the project schedule and increase expenditures but must be prioritized before aesthetics are considered. Managers must also communicate with external agencies such as regulatory bodies before they start any renovation and make sure that the construction and addition of features comply with any rules. After the initial needs, purpose, and logistics are sorted for a renovation, managers then need to contact architects, designers, and contractors. First, contractors will work with you to develop a data-based visualization or 3-D view of what your office could look like. They can work to help you understand not just logistics, but also the end-result ambiance of various spaces. At this stage, consider incorporating elements that prioritize the health and well-being of employees, such as natural light, exercise or "play" spaces, flexible-use furniture, and areas built for a variety of uses. One of the critical elements of this type of project is finding people who are genuinely qualified for the job. Don't be afraid to ask for references or check their online reviews and testimonials before you sign onto a contract with them. Also, try to find companies that specialize in the kind of renovation that you are looking to get done. To this end, ask for reviews and reports about previous projects, including details surrounding schedule and budget. Once you have the logistics and scheduling down, you can then consult with designers to get a clear understanding of how the aesthetics, materials, and décor will impact your staff. You need to discuss color, design, and placement of furniture for both looks and functionality. It's also important to understand where you and your staff will be sitting to make the space functional and easy to navigate for employees and customers. In this step, you'll want to set a clear vision for your space, incorporating details that match your industry, brand, service or product, and employee or client demographic. Once everything is organized and ready, try not to cut corners. Every detail on the job needs to be completed exactly how it was planned. Getting the whole process right from the get-go is not only important budget-wise, but it's also essential for everyone to stay safe and happy both during and after the renovation. A detailed schedule is a crucial part of this. If you're coordinating a few different specialists or even your staff and the lead project coordinator, be sure to ask for a detailed schedule in advance and ask for updates as the project moves along. Oeveo specializes in office renovations and ensuring that all of those small details are noted, improved, and delivered. Learn more about what we do at Oeveo.